Sometimes you discover a minor character who embodies the soul of a movie. The 1951 WWII bio-pic The Desert Fox has a perfect example of such a character, as portrayed by British actor Leo G. Carroll. The Desert Fox is the story of famed German General Erwin Rommel, who pummelled Allied forces in North Africa before transferring to Western Europe to prepare against the D-Day invasion. James Mason plays Rommel, a sympathetic man who’s a curious mix of strategic logic and unquestioning devotion. As the film opens, we see Rommel is at the peak of his military success in North Africa. But his troops lack equipment and fuel because these items are being saved for the higher-priority Russian front. A frustrated Rommel does not blame Hitler for this mismanagement; he is convinced a virtuous Fuhrer is being led astray by imbeciles in Berlin. Nevertheless, there are those who try to convince Rommel that Hitler is the reason for the problems. For example, Cedric Hardwicke is Karl Strölin, a man who tests Rommel’s views re: the function of a soldier versus the duty of a soldier. 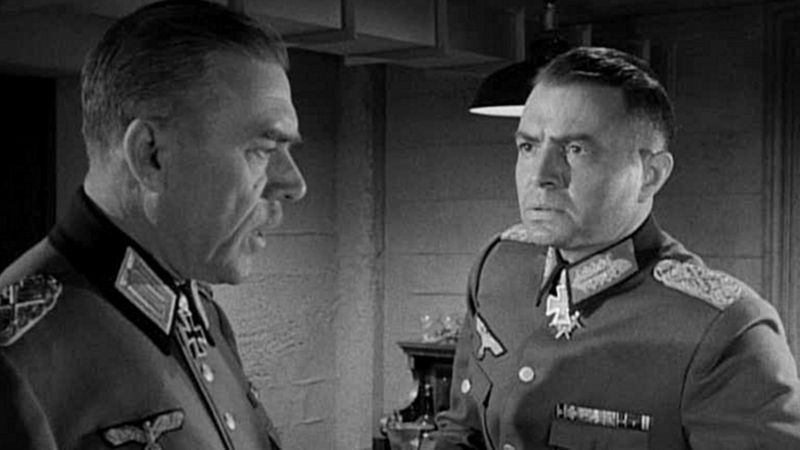 There is also Field Marshal Gerd von Rundstedt (Carroll), the barometric character in this film. Undoubtedly, von Rundstedt’s most meaningful scene is his last. He and Rommel are in a fortified situation room near the west coast of France. Von Rundstedt is D-O-N-E, meaning he’s done with inept leadership and self-delusion and killing. He tells Rommel that Adolf Hitler does not actually believe there will be a large-scale Allied invasion of continental Europe. In that moment, the whole of WWII unfurls before us like a banner. Here is the actor Carroll, as von Rundstedt, clad in the costume of a once-great army that shocked the world with dazzling military prowess. But now, in its place, stands an isolated Field Marshal with the pallid demeanour of a prisoner of war. It’s over for him, and for Germany. There’s no more conquering to be had. We dare not believe the consequences of those four sharply-spoken words. Von Rundstedt calmly places the receiver in the cradle, as though he had just spoken to his adjunct about a routine errand. He picks up his hat, drapes his coat over his arm, and tells Rommel that within 24 hours he will be named his successor. Carroll exits the scene and is gone. But he’s not just gone from the scene, he’s gone from Mason, from the movie, from us. “Come back!” we want to cry, but it’s too late. His character has just told Berlin to surrender. There’s no rebounding from that. Now the movie feels small and narrow without Carroll; his abrupt disappearance weighs on us and follows us from behind. For the first time, we feel actual despair and a little panicked. The Desert Fox is an absorbing examination of war and deception, and the collapse of a military empire. Leo G. Carroll, in his brief scenes, underscores this tale brilliantly. The Desert Fox: The Story of Rommel starring James Mason, Cedric Hardwicke, Jessica Tandy. Directed by Henry Hathaway. Screenplay by Nunnally Johnson. Twentieth Century Fox Film Corporation, 1951, B&W, 88 mins. I was totally caught up in the moment and the performance through your analysis and description. Brava! Thanks, Patricia. As you know, this is a fascinating movie about a terrible yet very interesting time. Have always liked Carroll in “Tarantula,” a big-bug sci-fi film from the 50s. Plus he played Cosmo Topper in “Topper” on television from 1953 to 1956. Haven’t seen “The Desert Fox” for years, but you make me want to see it again. Thanks! Thanks very much! “Topper” is something I’ve yet to see because EVERYONE talks about it. I know I’ll like it if Carroll is in it. Ruth, the versatile Leo G. Carroll has long been one of Team Bartilucci’s favorite character actors (starting with his films with Alfred Hitchcock, of course :-). I’ll admit I don’t watch many war films, but I’ve always liked Carroll and James Mason, as well as Jessica Tandy, another Team B favorite. Like you, I was moved by Carroll’s angry retort: “Make peace, you idiot!” If only more people would get the message, in real life as well as in THE DESERT FOX. BRAVA for your moving post, my friend, as always! Carroll truly is versatile, isn’t he? He’s great in everything, and I can see why Hitchcock liked to cast him. He he…. As soon as I saw your title I thought “yes. He is. Always.” Perfect! I am very sorry right now that I have never seen this film! I love your descriptions of this man, and of the story. I am in the mood for a good WWII film right now, and this looks like the one for me! Thanks, Paul. James Mason is fabulous, of course, but Leo G. Carroll makes the movie something special. I’d be interesting in reading your thoughts on it once you see it. I love your description of Leo Carroll as “a minor character who embodies the soul of an entire movie.” Also, your explanation of Carroll as wearing “the uniform of a once great army” compared to the “pallid demeanor of a prisoner of war.” What a great description and contrast that helped me see what you were talking about. Sounds like a fascinating movie, and I look forward to seeing it. Thanks, Ruth! I hope you get a chance to see it. All of the acting is great, but it wouldn’t be the same movie without Carroll. I remember this movie, Ruth, and the hopelessness of both Rommel and Rundstedt. Had Hitler half the brain he thought he had, the War may have gone quite differently. Although I was aware of Leo G, Carrol in the film — oh, how I loved Topper! — my attention was always riveted on Rommel. Dad was stationed for a brief time in North Africa and, though it was after the Germans were vanquished, he spoke highly of Rommel. It’s been ages since I’ve seen the film and maybe it’s time I have another look. Rommel is a riveting character, to be sure. They were right to cast Mason. I bet your Dad had some interesting stories of his time in North Africa. So many people on both sides spoke highly of Rommel – it speaks volumes about him, doesn’t it?